Like it or not, Uber is setting major trends for the future. But like all big changes, they come with both good and bad baggage. Uber has been gathering a pretty bad reputation, and a lot of its grief has been self-caused. Some business rules are basically just laws of nature, and amidst all the other challenges of running a successful, game-changing company, many of these rules are being forgotten. So if you want avoid shooting yourself in the foot the way Uber has done time and time again, you can check out these 6 classic lessons that, I think, we should all kinda remind ourselves of. Number 1: Being Likeable is Good. Yes, I’m starting with the basics here, and it doesn’t get more basic than this: it’s good to be liked. I’ll give you some context: Uber is what Silicon Valley calls a ‘disruptive’ technology, a breakout killer app that proves so popular that it can change current market practices basically overnight. But when these disruptive techs emerge, they are often so flushed with success that they can stop caring about pretty basic things, like being likeable. Uber, love it or hate it, is not exactly a likeable company. From their competitive bullying tactics, to their opportunistic surge prices during times of crisis, they’ve generated a lot of anger over a huge number of things from a wide range of people, from customers, to drivers and employees. It’s easy to see why a company has to lose so much money to lawsuits, PR, sales & marketing, simply because they’ve damaged their own reputation at so many steps along the way. Sure, the company is wildly successful. It offers a service everybody wants. Heck, it’s setting the benchmark for the future economy. But it has forgotten an important reality of the information age economy: that being likeable is more crucial than ever. And if you have trouble making friends, then everything is gonna be a bit more difficult. Number 2: Philanthropy is also good. Doing good deeds doesn’t just make you feel warm and bubbly inside. Society needs philanthropy because it helps get important things done. Incidentally, successful tech companies have the power and money to make it happen. Hint hint, Uber. Uber has upped its charitable game recently, sure, but it has largely ignored it in the past, even when a perfect opportunity arose. For example, when Hurricane Sandy hit New York in 2012, shutting down the subways, Uber capitalised on the situation in the saddest way imaginable, through huge surge pricing which meant New Yorkers will have no choice but to pay extra. Sure, there are counter-arguments of the positive effects of surge pricing, but this Fortune article summarises it perfectly. While Uber’s logic is fair, the general humanity is missing. You can argue with the negative backlash, but you can’t argue that Uber’s treatment of this major disaster had bad effects on their reputation. They could have been the saviour of New York City, instead it went about it in a business-as-usual manner, which left many calling it a ‘PR Nightmare’. It’s easy to think a great product is all a company needs, but the reality is, fineprint is why businesspeople exist. Uber CEO Travis Kalanick explained that there’s ‘no broad customer policy’, which may seem appealing to some customers who like the ‘laid back’ approach. But really taking time to create firm policies solves more issues down the line, and avoiding it is more trouble than it’s worth. Case in point, Uber has gathered the reputation of appeasing and bending over backwards to please customers. When a huge backlash came from $100 surge price fares, Uber began hurriedly handing out refunds left right and centre through CSR discretion. Clear, non-negotiable policies, terms and conditions exist for a good reason. They save time and trouble for everyone involved. It also acts to preserve the dignity of a business. A self-respecting company would listen to a customer’s concerns, but also firmly remind them that their pricing stands the way it is, and for a reason. A company needs more than insane customer growth. The idea of more = better can lead to huge problems down the line, and no company better shows this than Uber. Uber’s biggest money-guzzler has been sales and marketing, which really shouldn’t be the case for a company which has spread so much via word of mouth. Many people hear about Uber through friends and the news long before it is seen advertised. Sure, you can say that the ensuing fame resulted from all the sales and marketing, but come on, Uber is a product that can sell itself. It’s probably the most cliched lesson on this list, but that’s because it’s so relevant. Uber’s greatest offer is a convenient, affordable service. And the provider of that service, really, is the driver. Uber is just the middleman, providing an app that hooks passengers up with cars. All businesses have their own ideas of how important the various job roles are for the company, but in Uber’s case, it should be pretty clear – the drivers are, like, really important. But it seems like this is a lesson Uber hasn’t learned. Many are speculating that Uber’s biggest future problem is not in more lawsuits, but rather, the failure to attract new drivers. This is in part due in part to its reputation of dissatisfied drivers, but also with many Uber drivers claiming that making a living through the app is infeasible. If Uber stops wasting its time bullying journalists, competition and even its own staff, then maybe it can start focusing on the true heart of its company: the driver. Competition and criticism should help you grow, not destroy you. There’s a reason we call it ‘constructive’ criticism. Because it exists for the purpose of making you better. Criticism is constructive when it can be used as an opportunity to address those flaws. Same deal with ‘healthy’ competition. Competition is healthy when it allows your company to grow, to reflect and discover its true unique offer. Competition is about learning to improve your brand in productive and creative ways. Instead, Uber has faced competition and criticism with destructive ways. You can read plenty about their vicious relationship with Lyft, like sabotaging their fundraising and their whole service for some, or their Machiavellian tactics towards of journalists. Uber’s paranoia about competition and criticism is so great, they have become antagonistic and aggressive in the dealings with… basically, anyone. Not only is this damaging Uber’s reputation, but it’s damaging to the company as a whole, because they’re not using the competition to develop personally. Don’t look at your competition destructively. Instead look at them creatively, and you will always have the upper hand. You can spend ages reading articles like this, learning about how to avoid mistakes, but the truth is we’re all human. We all make mistakes. Sometimes it’s healthier for a business to bite the bullet and make that mistake, rather than tentatively tip-toeing around in order to avoid one. After all, it’s often not the mistake itself which is the issue, but how you handle the mistake. Uber’s CEO Travis Kalanick is frequently issuing apologies over various PR mistakes, from ridiculing his own drivers to internal sexism and sexual harassment debacles. Sure, apologies is the least Travis can do, but it is through Uber’s (sometimes) self-deprecating CEO that we finally see a bit of humanity. The boss who admits he needs to ‘grow up’, has given something to the company’s cold, algorithm driven business. He is the face of the company, and he is the person we turn to every time there’s another PR disaster or complaint to be made. So we’ll leave this blog with a positive message, that Kalanick, much like Uber itself, is something brilliant, something special, but has a long way to go before the world is fully ready for it. In the meantime, don’t be afraid to make mistakes, just make sure that you’re ready for them, ready to deal with them, and always ready to learn. 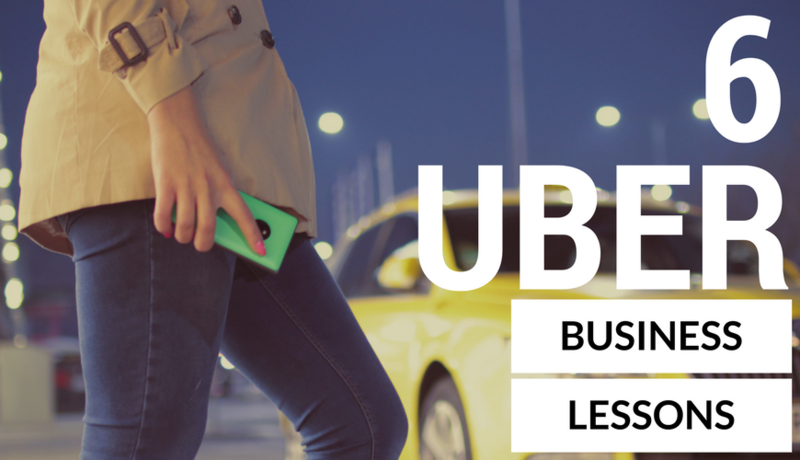 There you have it – 6 Classic Business Lessons that we believe Uber’s mistakes can teach us all. We really hope this has been of some help to you, or has given you something of value that you can apply to your own business. Do you think there is another lesson that Uber can teach us? Or did we make a mistake of our own in this article? If so, we’d like to hear about it. Leave a comment below or get in touch with us directly at [email protected]. For many years, the spotlight has been on Uber. Now, enough time has passed that we can look back on what this company has done wrong.